Brno is the capital of Moravia and the second city of the Czech Republic. It is famous for its higher education, manufacturing, trade fairs and Motorcycle Grand Prix. Brno is 200km to the south east of Prague. The trams started in Brno in 1869 and they are now part of the Dopravní podnik města Brna (DPMB) public transport network. There are 13 routes on the system covering some 70km with a fleet of some 310 vehicles made up of a variety of types. It was modernised in the 1960’s with many CKD Tatra types, mostly single car T3’s and articulated K2 types. A good deal of rebuilding has taken place with many low-floor sections being added as well as new style trailers being built to low-floor design. In 2003 17 part low floor Skoda Anitra 03Ts entered service. 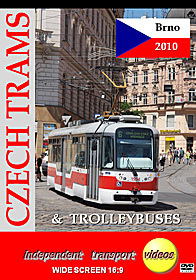 The newest cars are Skoda Anitra 13Ts that entered service from 2007 and are similar to Prague’s Elektra trams which can be seen operating in Prague on our Czech Trams 1, Part 1 and Part 2 programmes. As you will see, the standard livery is red and white, but a number of trams carry advertising liveries. Brno also has a fleet of Skoda trolleybuses that operate an intensive network of routes which is the country’s largest system. They began in 1949 and there are 13 lines both urban and inter-urban. We film a number of these vehicles as they operate amongst the trams in this very smart Czech city. Our filming starts at the busy tram and trolleybus station outside of the main railway station and along Benešova, as numerous trams and trolleybuses are seen in service on this very warm, blue sky summer’s day. Our cameras move around the city and film at a number of locations such as Nádražni, Masarykova, Rašinova, Ceská and Rooseveltova. This is a beautiful city with the buildings giving a superb backdrop to our filming. We head back to the tram and trolleybus station adjacent to the railway station again to capture the late afternoon rush, filming at Divadelní and Benešova on our way there. There are also buses running in parts of the city, but the trolleybus and tram reign supreme. Brno is well worth a visit as it offers such variety and interest to the transport enthusiast.